Wow!! Our Stores Loved Caterina by Jordan at Bridal Market!!!! Well…..another Bridal Market is in the books here at Blake & Company. A BIG thanks to all the wonderful stores that came to the showroom to see the Spring 2013 collections. One of the highlights was Caterina by Jordan. All of the stores loved the line. The young looks…prices…..huge color availability made it a winner!!! The Spring season is going to be FANTASTIC!!!!!! Caterina by Jordan…Our New Addition!! Blake & Company is very happy to be adding Caterina by Jordan to our showroom! This line is amazing. All styles are available in over 75 colors, sizing is 0-34 in missy and petite sizes, various lengths offered on select styles and rush cuts are available. The looks vary from beautiful light chiffons to dramatic taffeta to embellished tulle. 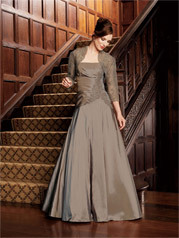 Perfect for Mother of the Bride and Mother of the Groom. We can’t wait to show you the collection!